Hi. My name is Ian Senior. I’m originally from Leeds, England but moved to the USA in late 2001. At first I lived in Center City Philadelphia but now live up in Bucks County, PA about 30 minutes drive north of the city. I was never athletic as a kid, in fact I was the overweight kid through much of school (and beyond). I have been on various diets since I was about 10 and nothing worked, nothing stuck and it was pretty much a yo-yo cycle. Around the time I was 17 I lost about 40 pounds but was never athletic or worked out in any way so ultimately gained my weight back (if not more). Most of my working life was spent sitting at a desk, traveling in a car, plane or train somewhere and then spending the evening in a hotel room with a laptop and the TV. Not the ideal for healthy living. What finally changed was due to a couple of things. I changed jobs which reduced the travel/room service/restaurant diet, where I worked had a gym on site (although I didn’t immediately join) but most importantly I hit the realization that my time had come to actually do something about it for real. It seems that the silliest thing can set you off on a journey sometime but what was the catalyst for me was actually buying my first iPhone. I ordered the iPhone 4 when it came out and received it in July 2010. When looking at some of the popular and recommended apps I came across a ‘Couch to 5K’ app. I figured I would give it a go. It was a 9 week program and knowing me I would at least give it a couple of weeks. Well, I got hooked on the ease of the technology. I joined the gym on August 1, 2010 and started my first run on August 2nd. I scheduled time on my work calendar for the gym and stuck to it. Never imagining how far I would go. I started to see a difference in the first couple of weeks and figured I should start looking at what I ate. I downloaded the ‘LoseIt’ app by the third week of August and have been using it daily for over 2 years now. Now I don’t have enough time in my lunch hour for my workouts so I became an early bird. I either run outside (in all my night gear) or run in the gym near me (open 24 hours – no excuses). Yup, I’m hooked. 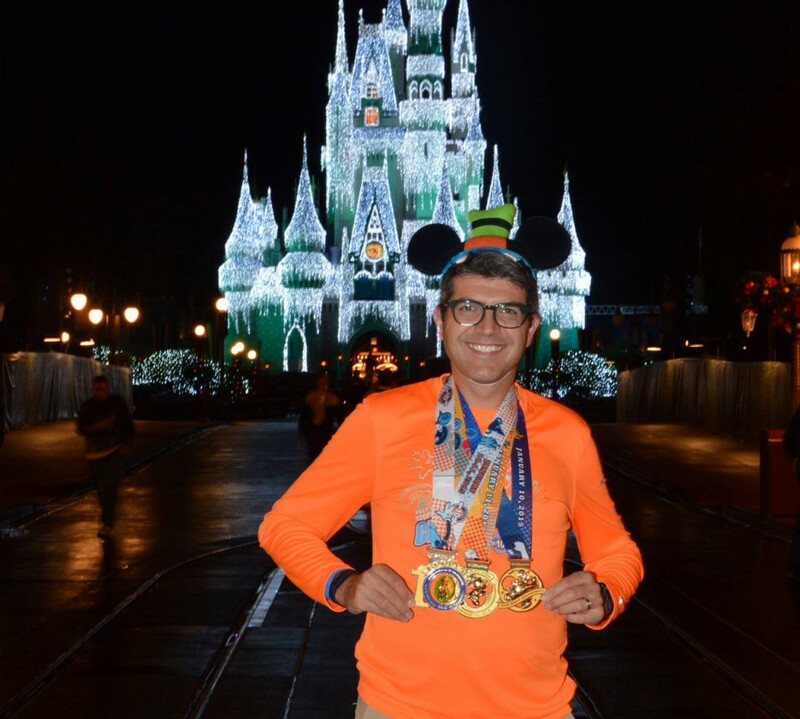 I started this blog as a way to keep me on track, share experience in getting to and completing the 2013 Walt Disney World Goofy’s Race and Half Challenge and to share some thoughts on life, running, races, gear and other subjects that seem to pop into my head. As of January 2014 I have lost almost 60 pounds, logged over 4,500 miles (since I started recording in September 2010) and run 12 half marathons, 7 full marathons and many 5K and 10K races.